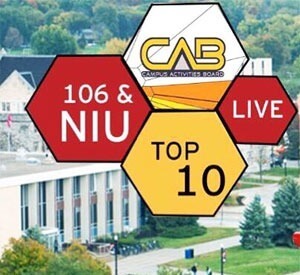 NIU’s Campus Activities Board will host the 106 & NIU Tribute Show Saturday, April 16, in the Duke Ellington Ballroom of the Holmes Student Center. Doors open at 7:30 p.m. and close at 8:30 p.m. The show will feature rappers, singers, dancers, DJs, musicians, models and more. Urban attire from the early 2000s is strongly recommended. Admission is free; tickets are available online. For more information, email CAB@niu.edu.